LONG POND, Pa.–Taking advantage of a caution, Kasey Kahne buried his car into Turn 1 with two laps left and grabbed a win from Hendrick Motorsports teammate Jeff Gordon in Sunday’s GoBowling.com NASCAR Sprint Cup Series race at Pocono Raceway. 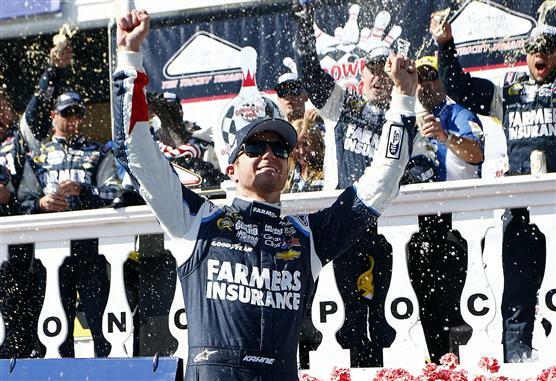 Kahne picked up his second victory of the season–all but assuring a berth in the Chase for the NASCAR Sprint Cup–his second at Pocono and the 16th of his career. Gordon ran second, 1.392 seconds behind, followed by Kurt Busch, Ryan Newman and Dale Earnhardt Jr. Penske Racing teammates Brad Keselowski and Joey Logano ran sixth and seventh, with Kyle Busch, Tony Stewart and Greg Biffle completing the top 10. Kahne gained one position to eighth in the Cup standings, but, more than anything, the second victory gives him a substantial degree of comfort where the Chase is concerned, given that no driver in contention for a wild card spot currently has more than one win. Kahne made the winning pass to the outside of Gordon through Turn 1 and cleared his teammate near the entry to the Tunnel Turn at the 2.5-mile triangular track. “On that final restart, I spun my tires a little bit and he (Gordon) got a great jump, and Kurt pushed me all the way to Turn 1, which really helped,” Kahne said. “I had one opportunity to either go for it and make it work or not. As good as our (car) was all day long, I thought we could make that work on the outside. Gordon was the epitome of mixed emotions after the race. The second-place finish elevated him to ninth in the standings, but Gordon is still winless this season and therefore in danger of missing the Chase if he has serious trouble in any of the five races remaining before the Chase field is set at Richmond. Gordon also acknowledged ruefully that Kahne simply outdrove him after the final restart. “I got a perfect restart on that last one, probably jumped him a little bit,” Gordon said. “And I got in front of him, and it looked like I needed to block the inside, so I kind of protected the inside, and he blasted up around the outside and outdrove me through (Turn) 1. Pole winner Jimmie Johnson was one of the speed horses in the field, but the series leader blew a right front tire on Lap 76 and pancaked the right side of his No. 48 Chevrolet SS against the outside wall near the exit from the Tunnel Turn. The accident knocked Johnson, who had led 43 laps to that point, out of contention for the win, but it took a subsequent caution on Lap 95–after David Stremme sideswiped the Turn 1 wall–to return all the lead-lap cars to the same pit stop cycle. Kahne took control after a Lap 108 restart, but two laps later Danica Patrick’s Chevy spun underneath Travis Kvapil’s Toyota in the Tunnel Turn and ignited a wreck that also collected hapless Jeff Burton and Richard Childress Racing teammate Paul Menard. The field was bunched for a restart on Lap 116, but that was merely a momentary speed bump for Kahne, who pulled away from Kurt Busch to a lead of 4.851 seconds by Lap 125. The driver of the No. 5 Chevy extended his advantage through a cycle of green-flag stops and was more than seven seconds ahead of Gordon when NASCAR called the eighth caution on Lap 149 because of debris in Turn 2. Gordon surged ahead of Kahne after the restart on Lap 153, but a caution on Lap 156 for Matt Kenseth’s spin in the Tunnel Turn bunched the field again and gave Kahne a chance for redemption with two laps left. Notes: Johnson rallied from his brush with the wall, finished 13th and extended his points lead over 14th-place finisher Clint Bowyer to 77 points… Gordon and Kurt Busch finished second and third on their respective 42nd and 35th birthdays. Only three drivers—Cale Yarborough (twice), Kyle Busch and Matt Kenseth—have won Sprint Cup races on their birthdays… Brickyard winner Newman’s fourth-place result left him nine points behind Martin Truex Jr. (15th Sunday) in the race for the second wild card spot in the Chase. 1. (18) Kasey Kahne, Chevrolet, 160, $208500. 2. (22) Jeff Gordon, Chevrolet, 160, $199221. 3. (5) Kurt Busch, Chevrolet, 160, $153930. 4. (4) Ryan Newman, Chevrolet, 160, $161343. 5. (25) Dale Earnhardt Jr., Chevrolet, 160, $125385. 6. (11) Brad Keselowski, Ford, 160, $152351. 7. (6) Joey Logano, Ford, 160, $121593. 8. (2) Kyle Busch, Toyota, 160, $132568. 9. (20) Tony Stewart, Chevrolet, 160, $129910. 10. (7) Greg Biffle, Ford, 160, $101535. 11. (3) Carl Edwards, Ford, 160, $120685. 12. (8) Marcos Ambrose, Ford, 160, $111674. 13. (1) Jimmie Johnson, Chevrolet, 160, $141596. 14. (16) Clint Bowyer, Toyota, 160, $120143. 15. (26) Martin Truex Jr., Toyota, 160, $113985. 16. (12) Jamie McMurray, Chevrolet, 160, $106530. 17. (14) Kevin Harvick, Chevrolet, 160, $123171. 18. (28) Mark Martin, Toyota, 160, $92685. 19. (33) Bobby Labonte, Toyota, 160, $105393. 20. (10) Aric Almirola, Ford, 160, $117046. 21. (30) David Ragan, Ford, 160, $102718. 22. (24) Matt Kenseth, Toyota, 160, $113201. 23. (32) Dave Blaney, Chevrolet, 160, $92018. 24. (29) Casey Mears, Ford, 160, $97293. 25. (36) JJ Yeley, Chevrolet, 160, $77860. 26. (23) Travis Kvapil, Toyota, 160, $94607. 27. (41) Timmy Hill #, Ford, 158, $78285. 28. (19) Juan Pablo Montoya, Chevrolet, 157, $103849. 29. (38) Landon Cassill(i), Chevrolet, 157, $73485. 30. (31) David Stremme, Toyota, 151, $77335. 31. (35) David Reutimann, Toyota, 141, $73185. 32. (21) Paul Menard, Chevrolet, 127, $103001. 33. (15) AJ Allmendinger, Chevrolet, Brakes, 122, $80810. 34. (17) Ricky Stenhouse Jr. #, Ford, 113, $120946. 35. (34) Danica Patrick #, Chevrolet, Accident, 110, $72460. 36. (13) Jeff Burton, Chevrolet, Accident, 109, $80210. 37. (39) Joe Nemechek(i), Toyota, Accident, 55, $72028. 38. (43) Tony Raines(i), Chevrolet, Brakes, 53, $67050. 39. (37) David Gilliland, Ford, Accident, 51, $63050. 40. (27) Michael McDowell, Ford, Brakes, 44, $59050. 41. (40) Josh Wise(i), Ford, Brakes, 44, $55050. 42. (42) Alex Kennedy, Toyota, Vibration, 22, $51050. 43. (9) Denny Hamlin, Toyota, Accident, 14, $67350. Average Speed of Race Winner: 129.009 mph. Time of Race: 3 Hrs, 06 Mins, 02 Secs. Margin of Victory: 1.392 Seconds. Caution Flags: 9 for 35 laps. Lead Changes: 27 among 14 drivers. Lap Leaders: J. Johnson 1-33; B. Keselowski 34; Kurt Busch 35-41; J. Gordon 42; D. Earnhardt Jr. 43-44; M. Kenseth 45; J. McMurray 46; J. Johnson 47-53; B. Keselowski 54-57; K. Kahne 58-70; R. Newman 71-72; J. Johnson 73-75; T. Stewart 76-78; K. Kahne 79-82; B. Keselowski 83-88; K. Kahne 89; B. Keselowski 90-91; K. Kahne 92-95; B. Keselowski 96; M. Truex Jr. 97-103; K. Kahne 104-129; Kurt Busch 130-131; A. Almirola 132; D. Blaney 133-135; D. Ragan 136; K. Kahne 137-152; J. Gordon 153-158; K. Kahne 159-160. Leaders Summary (Driver, Times Lead, Laps Led): K. Kahne 7 times for 66 laps; J. Johnson 3 times for 43 laps; B. Keselowski 5 times for 14 laps; Kurt Busch 2 times for 9 laps; M. Truex Jr. 1 time for 7 laps; J. Gordon 2 times for 7 laps; T. Stewart 1 time for 3 laps; D. Blaney 1 time for 3 laps; D. Earnhardt Jr. 1 time for 2 laps; R. Newman 1 time for 2 laps; A. Almirola 1 time for 1 lap; D. Ragan 1 time for 1 lap; J. McMurray 1 time for 1 lap; M. Kenseth 1 time for 1 lap. Top 12 in Points: J. Johnson – 772; C. Bowyer – 695; C. Edwards – 688; K. Harvick – 675; D. Earnhardt Jr. – 656; Kyle Busch – 646; M. Kenseth – 638; K. Kahne – 612; J. Gordon – 602; G. Biffle – 599; T. Stewart – 594; B. Keselowski – 592.